The Fig. 1 shows a general distribution system in d.c. form where d.c. generators are used at the generating stations. As explained earlier, the feeders are used to feed the electrical power from the generating stations to the substations. The distributors are used to distribute the supply further from the substations. The service mains are connected to the distributors so as to make the supply available at the consumers permises. 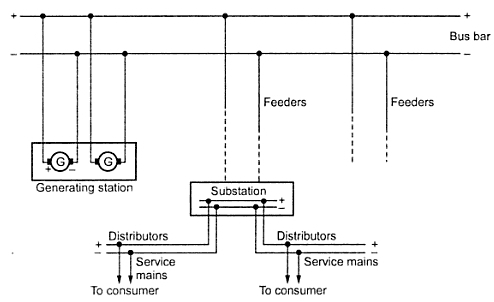 This is the simplest two wire distribution system used to supply the consumers. One more type of d.c. distribution system is also used in practice which is d.c. there wire system. Though for d.c. distribution, mainly two systems are used, the various types of distributors are used in these systems.